Last week, I announced that our weekly Hackfest would be working on a Facebook application. We decided to make it an open source application hosted on Google Code, which you can access here: http://code.google.com/p/fblotd. It is licensed under the new BSD License. In week two of our weekly Hackfest, Glenn and I worked on the visual design for the profile box of our application. We agreed that it would be the area where we anticipate most of our users to interact with the application, so it needed to be focused on first. I know I promised a write-up of the overall concept of the application in my previous blog entry, which I never got around to. However, I’m hoping that the visual design communicates the intent of the concept enough that people who see it will just “get it”–otherwise, it won’t be as effective of an application if it needs explanation before users can understand it. 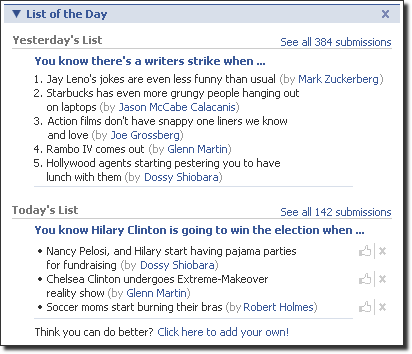 In a nutshell, users are encouraged to complete the sentence that makes up the “List of the Day” as well as vote for submissions by others. The next day, we’ll display yesterday’s list and the top five submissions as voted by the users, followed by the current day’s new list. We know that there are plenty of directions we could take this concept but for the initial release, we’re keeping the scope small so we can get it done quickly–especially since the Hackfest only meets once a week for two or three hours at a time. Next week, I hope we can actually implement the code that implements the profile box. Then, we may open up the application so everyone can start adding it to their profile and help us test it! If you’d like to participate in the development of this app., join the Hackfest and come hack with us! We meet every Monday at the Panera Bread in Paramus, NJ. Once you’ve joined, you can RSVP for the next meetup so we’ll know you’re coming. If you have any questions about the app., feel free to ask them in the comments below.